Just when coaches thought they had streamlined their recruiting process with recruiting/compliance software, now they can take it one step further. West Shore Technologies and ACS Athletics are now partnering to offer college coaches a completely automated process for collecting and managing data about their recruits. Coaches who use West Shore’s SportsBoard iPad application to evaluate players can now seamlessly pass assessment data about any student athlete to ACS’ InControl compliance/recruiting system. 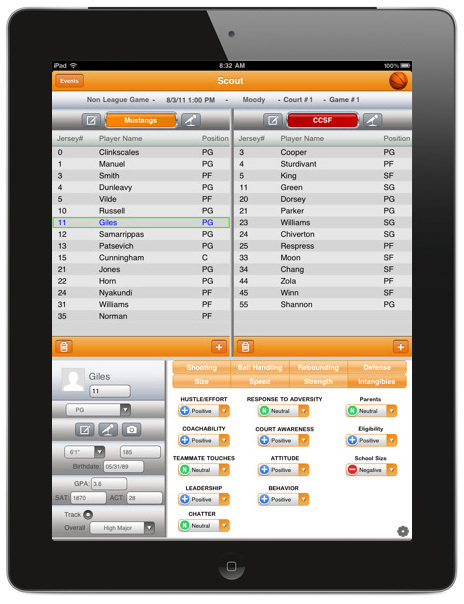 SportsBoard, the first iPad- and cloud-based recruiting assessment solution, enables coaches to rate players, take text notes, record voice memos, and capture photos and video with an iPad and then sync all of that data with its server in the cloud in order to apply analytics and rank recruits by position. Phillip Engle, CEO and President, ACS Athletics states "As demand for mobile solutions grows, partnering with West Shore Technologies made sense for us and our customers. We are excited to add the SportsBoard iPad scouting application to our mobile portfolio and look forward to bringing their expertise and cutting-edge solutions to our customers." “We are thrilled about this partnership with ACS,” states Gregg Jacobs, founder of West Shore Technologies. “Not only will ACS be able to introduce us to all of their clients, our integrated solution will enable them to bring a valuable enterprise solution that automates their recruiting data collection process through compliance and commitment process. ACS, the industry leader in enterprise-based recruiting and compliance software, provides sophisticated and powerful cloud-based solutions to more than 50% of the FBS universities in the United States. West Shore Technologies offers SportsBoard Scout for soccer, basketball, lacrosse, volleyball, baseball, field hockey, and rugby and will soon offer it for football. For more information on this partnership, contact either company.